The Ardennes is a very frustrating movie in a very limited sense: it seems absolutely no-two-ways-about-it certain that it's going to be just great based on the first scene, and the whole rest of the movie is at best a significant step down in inspiration and execution. And what it turns out to be after this most barnburning whoop-de-doo of an opening is so enormously typical. It's worse, honestly, than if it had just been mediocre from the start. That opening, anyway: the camera floats underwater, basking in the cool blue of what's self-evidently icy cold water (this is, on the whole, an icy cold movie) and then a man plunges into frame, feet-first, face covered in pantyhose. It's something both ethereal and horrifying, watching this person who seems to be not-formed, an impression of a human more than actual one, and in a particularly extreme situation. The result is a particularly impressionistic introduction, one in which the general idea of sensations comes to the fore more than the specifics of plot. Then the man clambers out of the water, in a frantic hurry, and the sense of wetness begins to gain a concrete form; and once that happens, the man himself starts to feel more like a man, and the world around him starts to click into place, particularly the panicking woman he starts screaming at as he flies into her car, faster than we can follow, almost. The movie seems to emerge from abstractions. It really is the most astonishing thing. Anyway, the situation we've just stumbled into is that Dave (Jeroen Perceval) has just fled from a break-in gone wrong, leaving his brother Kenneth (Kevin Janssens) behind; the woman driving is Kenneth's girlfriend Sylvie (Valerie Baetens). We skip quickly over the next few years, during which time Dave and Sylvie have mostly managed to straighten up - Sylivie is in a drug addicts' support group, for one - and Kenneth is about to be released early from his 7-year sentence. This causes problems for the other two for a couple of reasons. One is that they've both come to release over the years that they actually don't much care for Kenneth, and that their lives are better off without him around. The other is that they're now lovers, quite unbeknownst to Kenneth, and he's not the kind to laugh off this sort of infidelity. And with that, the scene is set for a rather perfunctory character drama. Broadly speaking, the problem with The Ardennes is all in its middle: after that opening scene, the leap forward in time comes with a suddenness that forces us to consider the years-later versions of the characters before we've gotten a real sense of who they were in the past, and the performers are good enough to respect that tension. There's not a single beat in any of this that rightfully counts as "original", but originality is not the be-all and end-all, and there's real pleasure to come out of a film that matches its complex characters to finely-tuned performances, even when we can fairly well predict roughly what we're going to get, and roughly how we're going to get it. At least initially, The Ardennes seems like it's going to be just this thing. The performances are not created equal: Janssens is more blunt and one-note than his co-stars, which does neatly fit in with the themes of the piece, at least. Director Robin Pront (who co-wrote the screenplay with Perceval, based on Perceval's play - and credit where it's due, there's not one single scene of The Ardennes that feels stagebound) has a definite gift for helping his actors get into a ragged, tired place, and that alone is enough to propel the movie through its set-up. But when I say "that alone is enough", I'm not using a rhetorical flourish; that is, more or less, the lone strength of the film. It very quickly becomes clear that, having sketched out these nifty characters, nobody involved in making the film quite had an idea of what to do with them, and the long middle stretch of the 96-minute feature starts to feel very distinctly like it's stuck in a holding pattern, pushing buttons on the characters rather than being honest to them. And there's not much else but the characters to serve as a point of interest. 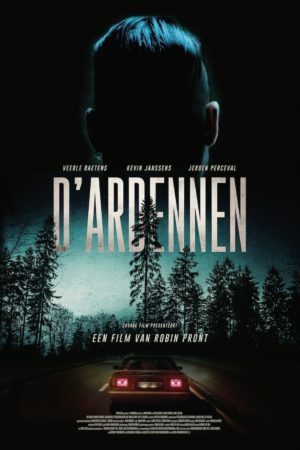 Probably the most distinctive thing in The Ardennes is its rather assertive cinematography, by Robrecht Heyvaert (residents of Flanders might notice a more distinctive thing, I am told; the film's dialogue apparently consists almost exclusively of a particularly robust dialect of Flemish Dutch that gives the film an insistent regional identity). But distinctive, in this case, doesn't mean that it's particularly good: the look of The Ardennes is positively besotted with color-corrected blues and slate greys, smothering any visual variety in favor of a monotony of glossy digital haze. It's moody in a cheap, distracting way; which isn't to say that it's not moody. But the mood it creates doesn't do much to augment the character drama, and it doesn't feel like it has much of anything to do with the film until it hits its third act (this is a very modular picture, structurally, perhaps because of its theatrical origins), which finally pays off the title and arrives in the heavy forests of the titular region, in the west of Belgium. The end of The Ardennes is pretty ludicrous and overindulgent in madcap violence, but at least it seems that the film finally decides to have a sense of humor about itself. It's also here that get a huge shot of life in the form of Stef (Jan Bijvoet), an ex-con who embodies a thuggish, poisoned form of masculinity hand-in-hand with a slithery rejection of gender norms altogether. And between the character and Bijvoet's growling performance, The Ardennes almost stumbles into having something interesting to say about violence behavior as a trap for males of a certain background. But there's nothing in the first hour leading up to this even a little bit, which robs the impact it might have. There's also the niggling feeling that this has nothing much at all to do with Kenneth and Dave, who are, after all, our protagonists. The result is a film that feels like it wasn't finished being assembled before it was ushered out into the world, and whose constituent parts were anyway not that interesting to begin with. It's not necessarily the case that this is bad, just perfunctory and wildly uninspired. At its best, The Ardennes feels like something we've all seen plenty of times before, and it spends a hell of a lot of time pretty far away from its best.